Heat oven to 450°F. Unroll pie crust; place in 10-inch tart pan with removable bottom. Press crust firmly against bottom and side of pan; trim edges. Bake 8 to 12 minutes or until light golden brown. Remove from oven to cooling rack. If crust puffs in center, flatten gently with back of wooden spoon. Cool 15 minutes. Meanwhile, in 2-quart saucepan, heat 3/4 cup of the cream over medium heat until bubbles begin to form around sides of pan. DO NOT BOIL. Remove from heat. Stir in chocolate until melted. 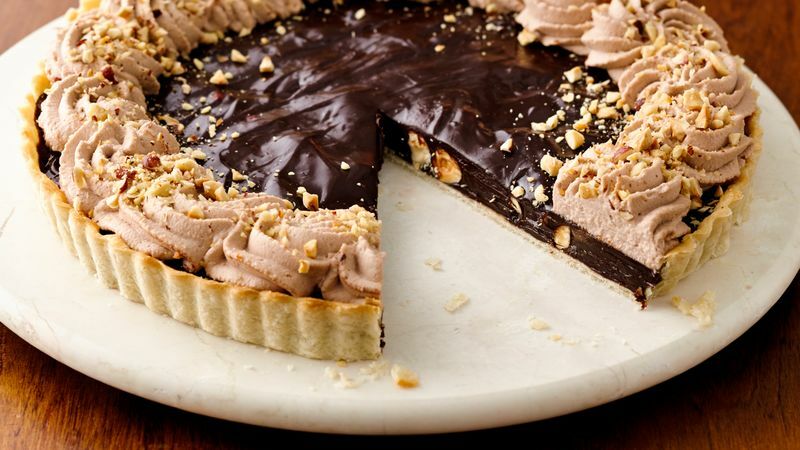 Stir in 1/4 cup of the mascarpone cheese and 6 tablespoons of the chocolate hazelnut spread until well blended. In small bowl, beat egg yolks with fork. Gradually add about 1/4 of the melted chocolate mixture to the egg yolks, stirring constantly. Stir egg mixture back into the pan of hot chocolate cream. Cook over medium-low heat, stirring constantly for 3 to 5 minutes until mixture begins to thicken; remove from heat. Spread 1/2 cup of the chocolate mixture in bottom of cooled crust. Press 1 cup of the toasted hazelnuts into hot filling. Carefully spoon remaining chocolate filling over nuts. Refrigerate at least 1 hour or until completely cooled. In medium bowl, beat remaining 1 1/4 cups cream with electric mixer on high speed until slightly thickened. Slowly add the remaining mascarpone cheese and the remaining 2 tablespoons chocolate hazelnut spread. Continue beating until stiff peaks form. Pipe or spoon whipped cream mixture over top of cooled tart. Finely chop remaining 1/4 cup hazelnuts; sprinkle over whipped cream. Store covered in refrigerator. Hazelnuts can be purchased toasted. If not available at your grocery store, toast hazelnuts by spreading in an ungreased shallow pan. Bake at 350°F 6 to 10 minutes, stiriing occasionally, until light brown. If desired, rub hazelnuts to remove some of the skin.